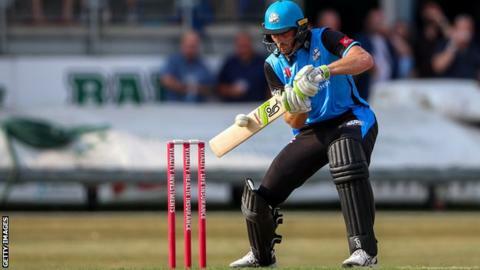 Worcestershire have re-signed New Zealand batsman Martin Guptill for this year's T20 Blast. The 2018 champions will have the 32-year-old available for 11 of their 14 group games and for the quarter-finals and Finals Day, should they qualify. Guptill played seven group games last summer and will rejoin the county after this summer's 50-over World Cup. "It is a huge confidence boost and we are chuffed he is coming back," said first-team coach Alex Gidman. "Guppy was wonderful around the group last year, a fantastic bloke, and he showed how good he was in a handful of wonderful innings for us. "We've got to make sure all our processes are in place and our preparations are spot on to give these guys the best chance of going out and enjoying their cricket and winning matches." Guptill made the second-highest ODI score of all time when he hit 237 not out against the West Indies in the 2015 World Cup quarter-final. He has scored 6,411 one-day international runs at an average of 43.61 as well as 2,272 T20 international runs at an average of 33.91.